While in recent years we have been choking and coughing through ground-level air pollution, and Himalayan peaks have disappeared behind a regional haze, the larger picture of air pollution may be changing. The recent widespread construction on Kathmandu Valley’s roads has unloosed such terrible amounts of dust that action to reduce air pollution finally seems imminent. And to support this potential action, a state-of-the-art air pollution monitoring network in Nepal has begun broadcasting data to the public. The atmosphere team at ICIMOD has supported the development of new air pollution monitoring networks in Nepal and Bhutan. To date five stations are operational in Nepal: in Kathmandu (Ratna Park)(pictured, right Aerosol scientist SP Praveen of ICIMOD and Shankar Prasad Paudel of the Department of Environment at Ratna Park observatory this week), Lalitpur (Pulchok), Kavre (Dhulikhel), Chitwan (Sauraha), and Lumbini (Rupandehi). For the first time ever, we have instruments broadcasting real-time air quality information through the government’s data portal. All of our stations measure PM10, and PM2.5, and ozone, as well as meteorological parameters needed to interpret pollution data: sunlight, pressure, temperature, relative humidity, precipitation, wind speed, and wind direction. PM10 is the mass density of particulate matter smaller than 10 micrometers (think dust particles), while PM2.5 is the mass density of particulate matter smaller than 2.5 micrometers (primarily smoke particles). Historically, more attention has been paid to PM10, but in recent years there has been increased recognition of the health impact of finer particles like PM2.5, that can penetrate deeper into the lungs. Soon, some half a dozen new stations will be added to the network, while at several stations gas analysers that measure carbon monoxide, nitrogen oxides and sulphur dioxide will also be brought online. Pollution levels started increasing as soon as the last monsoon rains ended. Particulate levels are higher in the mornings and evenings than at mid-day or late at night. The timing of the pollution peaks, however, do not coincide with rush hour as might be expected. Rather, these peaks are the result of a complex interplay between emissions, and when and how the Valley is ventilated. While the ground-level station at Ratna Park shows high PM10 levels due to wind-blown dust from nearby roads, PM2.5 levels at Ratna Park and on a 6th floor collection point in Pulchok show remarkably similar patterns, indicating that fine particles are fairly well mixed in the Valley’s air mass. The air in Dhulikhel is significantly cleaner than in Pulchok and Ratna Park, but Dhulikhel does experience a small peak of pollution in the late morning as Kathmandu’s pollution blows through. Surprisingly, PM2.5 levels in Chitwan are often as high as in Ratna Park, while in Lumbini they are often much higher than in Kathmandu. 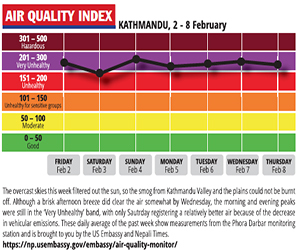 What this means is that air pollution is not a problem confined to the Kathmandu Valley. It is also common across southern Nepal due to industry, widespread open burning, use of biomass energy, and pollution that blows into Nepal from beyond its borders. The new air pollution monitoring network allows us to track such trends over time, and to increase our understanding of the processes that influence pollution levels. In addition, this network will serve to inform the public about when to avoid exposure to dangerous levels of pollution. Residents of Beijing, for example, check PM2.5 levels before deciding to exercise outdoors. The network will provide the basis for designing emergency response plans for cutting emissions when air pollution levels exceed certain pre-determined thresholds. We can learn from Paris and Mexico City which have successfully implemented these systems. In addition, the network will provide feedback about the effectiveness of our mitigation efforts. If you have a fever and take a paracetamol, you would measure your temperature to see if one tablet was strong enough to reduce the fever. If it doesn't, you take one more. Because air pollution in Kathmandu Valley has multiple large sources, reducing it requires targetting emission sources in different sectors, addressing the lowest hanging fruits in each sector immediately, and then moving on to more difficult measures. In a task force report submitted to the National Planning Commission this week we have identified action in 12 areas, while highlighting six immediate steps. Arnico K Panday is Senior Atmospheric Scientist and Programme Coordinator of the Atmosphere Initiative at ICIMOD.